Kenya today signed the Multilateral Convention on Mutual Administrative Assistance in Tax Matters. Kenya is the 12th African country to sign the Convention and the 94th jurisdiction to join it. 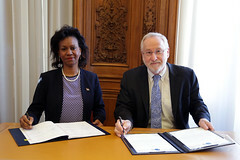 Salma Ahmed, Ambassador of the Republic of Kenya to France signed the Convention in the presence of the OECD Deputy Secretary General, Douglas Frantz. Salma Ahmed, Ambassador of Kenya to France and Douglas Frantz, Deputy Secretary-General of the OECD. By signing the Convention, Kenya takes a further step in fighting tax evasion and avoidance, building on its participation in the Global Forum on Transparency and Exchange of Information for Tax Purposes, which it joined in 2010.